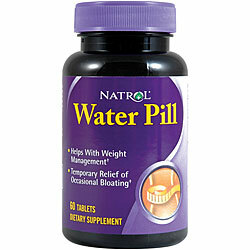 Water pills are aimed at getting rid of excess water (water retention) buy flushing the system using a diuretic. Diuretcis are used by people seeking to lose weight quickly – but on almost all occasions they are prone to both putting the weight straight back on again and not as harmless as they may first seem. The water pill sounds quite harmless – but weight loss is not what diurectics are intended for first and foremost. The primary intended use has little to do with weight loss. Diuretics have just a few distinct medical uses, hypertension ( reducing high blood pressure,) and treating some heart conditions. They can also be used cyclically for no more than one week in every month by women with premenstrual fluid retention. Diurectics remove sodium from the kidneys – excess water is also removed or flushed away in this process. The water is regained once the body is rehydrated. As the intended or primary function of the water pill is lower blood pressure – people that have a normal blood pressure can find their blood pressure descreases and become almost dangerously low. Absolutely not – we do not recommend you buy a commercial or over the counter water pill to be used in conjunction with any weight loss process. Water pills are ideally used under strict guidance from your GP or Doctor. If you have a particularly high BMI (Body Mass Index) you may be eligible for prescription slimming pill. Xenical (Orlistat) is the most commonly prescribed.